What if you could locate and resolve drafting issues instantly, both within your legal document as well as in related documents, and cut proofreading time in half? Drafting Assistant intelligently scans your legal documents in seconds, alerting you to errors, inconsistencies, missing information and more. You will be able to save hours when drafting documents and cut down time spent on proofreading and editing. 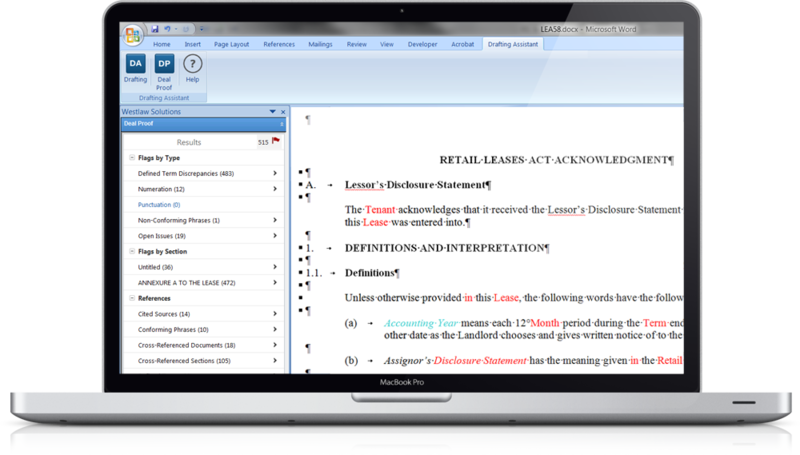 Drafting Assistant is a legal proofreading solution that works within Microsoft Word and allows you to quickly identify and assess potential drafting issues, such as defined terms, cross-reference discrepancies, omissions and numeration errors. Deal Proof – Real time analysis gives you a snapshot view of outstanding issues in a document, allowing you to access every issue easily and update the document seamlessly. Document Builder — Drafting Assistant works hand-in-hand with Contract Express, our document automation tool, and helps you create and proofread your documents with speed. PDF Convertor – Don't let anyone slow you down. PDF Convertor allows you to convert any PDF into a Word document and review the document quickly. Simple interface – Continue working in Microsoft Word without needing to implement yet another system. Just click the "Deal Proof" button and view the flags referencing issues within the document. Align your review process with the workflow and review errors from first page to last, focus on errors found in a specific section or review only a certain type of issue. Drafting Assistant catches items that I may have missed. 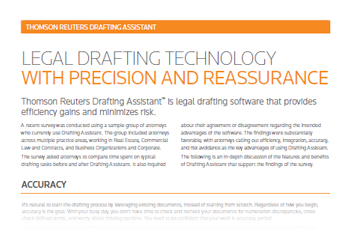 A recent survey was conducted using a sample group of lawyers who currently use Drafting Assistant. The group included lawyers across multiple practice areas, working in Real Estate, Commercial Law and Contracts, and Business Organizations and Corporations.